A 83-year-old woman chews, talks and swallows using an artificial jaw from a laser printer is rolled. She gets the credits for being the first human, talking with a 3d printing generated jaw. The technique was developed in Hasselt and Leuven. She suffered from a long lasting and rapidly progressive infection of almost the entire mandible with a large wound in her face. In order to retain an open airway, function of swallowing and chewing, surgical removal of the entire mandible was necessary to cure the patient. The operation was performed in June 2011 in the Orbis Medical Centre in Sittard (Netherlands). The lower jaw of an elderly Dutch woman was completely replaced by an artificial jaw made of titanium. It was manufactured by a 3D printer exactly the right size and had been printed layer by layer. By inflammation of the jaw , it was so badly damaged that it all had to be removed. Usually what follows is a heavy micro surgical repair that takes sixteen hours and can require several fragments of donor bone so that it can be reconstructed and to be put together. But with the age of the patient in mind, the surgeons preferred a customized and one-piece implant, which was designed and produced in Hasselt, Leuven. 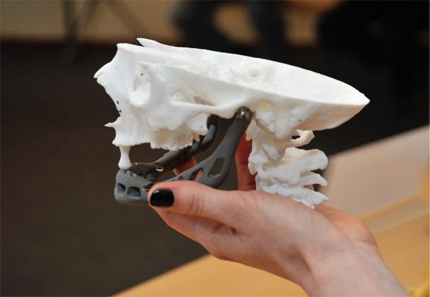 The mandible, including joint parts, was printed layer after layer by the Leuven company LayerWise.They used a 3d printer with titanium powder. During the printing process the powder melted, so that no glue or bonding agent was needed. The printer employed the art jaw also to contain cavities which muscles can attach to, slots through which blood vessels and nerves are guided and mandibular dental bridges and dimples so a denture can be screwed. “The job was done in a few hours,” says engineer Peter Mercelis of LayerWise. With classical techniques to implant manufacturing (milling or casting in a mold), it takes something a few days. The jaw was then coated with biokeramische bioceramics in Leiden, to be compatible with the tissue of the patient, and eventually weighed 107 grams Thirty grams heavier than a natural lower jaw, but not unpleasant for the patient, according to Mercelis. The cost of the artificial jaw is “between 7,000 and 12,000 euros, according to engineer Maikel Beerens of Xilloc Medical in Maastricht. More expensive than classical implants and not reimbursed by health insurance. “But because the operation is much shorter than a classical one, you’re better off at once,” said Ingeborg Kroon Burgh of UHasselt.